: Colorless to greenish liquid. with Characteristic spicy pepper odor. : Steam distillation of the dried berries. 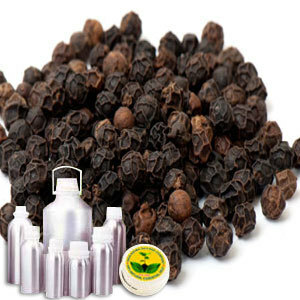 Black pepper is known to be a flowering vine that is cultivated for its fruit known as peppercorn when dried. It is a small drupe of 5 mm (0.20 in) in diameter, dark red when fully mature and usually used as a spice and for seasoning. This dried ground is used for its flavor as well as medicinal properties and may be found on nearly every dinner table in some parts of the world. It contains a-thujone, a-pinene, camphene, sabinene, b-pinene, a-phellandrene, myrcene, limonene, caryophyllene, b-farnesene, b-bisabolene, linalool and terpinen-4-ol. A middle note with a medium aroma, This Wildcrafted Oil has a sharp, spicy scent faintly reminiscent of Clove. It can mix easily with bergamot, clary sage, clove, coriander, fennel, frankincense, geranium, ginger, grapefruit, lavender, juniper, lemon, lime, mandarin, sage, sandalwood and ylang-ylang. Black pepper is used as a spice in Cooking for its flavor. In addition, it also finds usage in preparation of various Medicines.